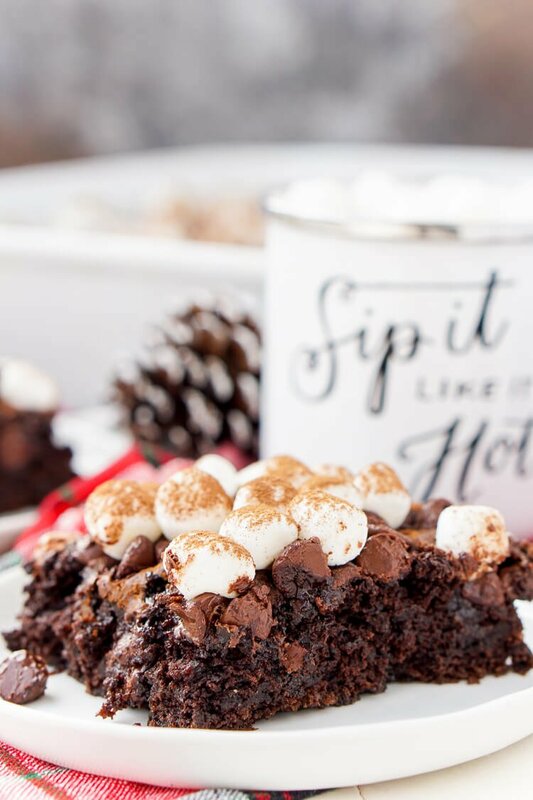 With this Hot Chocolate Dump Cake, there’s no need to decide between hot cocoa and chocolate cake – you can have both! An easy holiday dessert made with just six ingredients! 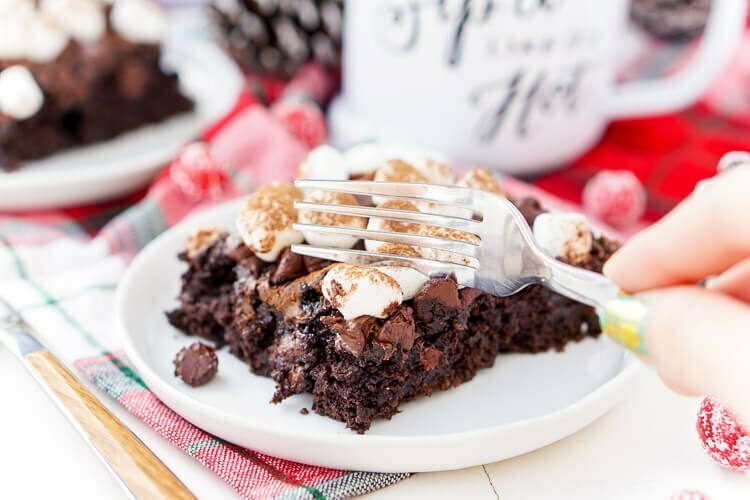 This Hot Chocolate Dump Cake is a super easy and delicious dessert for the holidays! The holiday season is coming out swinging and it’s time to start prepping the lineup for all those delicious desserts, drinks, and side dishes that will grace our holiday tables and parties. Now, I know you guys are busy, I am too, and sometimes what we really need are quick and easy recipes that are total wins without killing all of our spare time, because honestly, who has spare time during the holidays, to begin with!?! Now, I’ve never been an overly big fan of dump cakes, but I must admit, even this one I can get behind! It’s not messy like most others and comes out looking like an actual cake! What first caught my attention about this cake was that it’s made with just 6 ingredients, most of which I always have on hand, I don’t think you’ll ever see the day where I don’t have chocolate pudding mix and chocolate cake mix in my cupboard! You know what I never seem to have on hand when I need it? Eggs! Yet somehow half of every carton I buy expires, go figure, right? 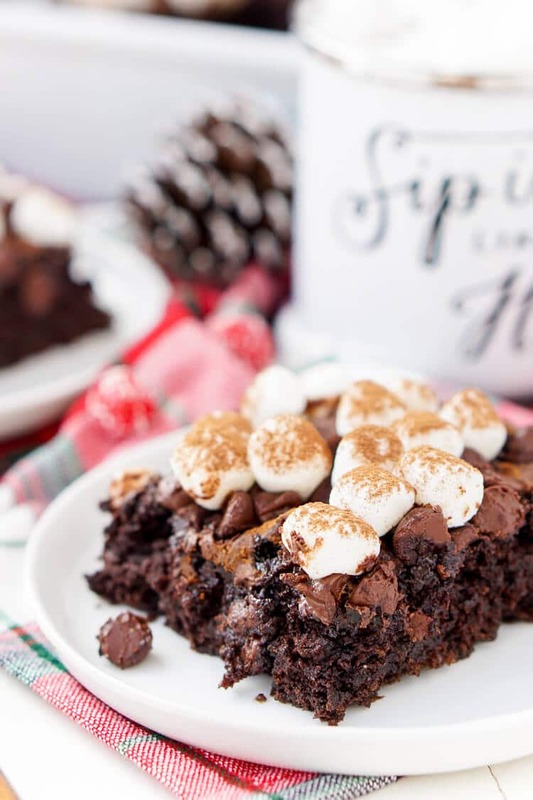 Luckily, this recipe doesn’t even require eggs, just chocolate pudding mix, milk, chocolate cake mix, marshmallows, chocolate chips, and hot chocolate powder. Yup, there’s a lot of chocolate happening in this cake! But who’s complaining! I mean, just look at all the chocolate goodness! 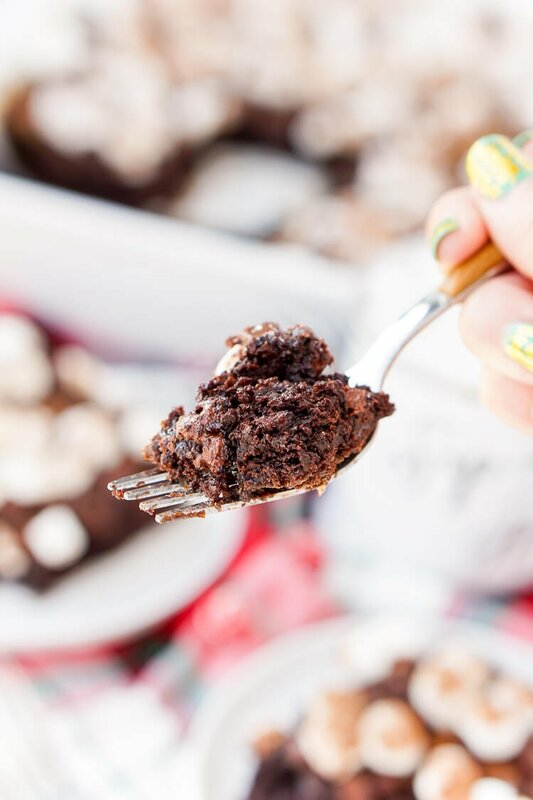 Can’t you just imagine yourself cutting your fork through the gooey slice right there? It’s pure heaven! This cake is one of the easiest I’ve ever made and I’m pretty sure you’re all going to love it too! It sure adds a nice alternative to the traditional pumpkin and apple desserts! Add chopped up candy canes or peppermint candies after baking. Replace regular chocolate chips with white chocolate chips. Sprinkle the top of the batter with chopped nuts before baking. Drizzle with Vanilla Icing before serving. The batter for this cake is extremely thick and sticky, use a silicone spatula to spread the batter for best results, or spray a wooden spoon with non-stick spray. You can either mix the chocolate chips directly into the batter or you can sprinkle them over the top of the batter just before baking. Make sure to use a 9×13-inch baking pan for this cake. Pin this Dump Cake Recipe for Later! Watch How to Make this Dump Cake in the Video Below! 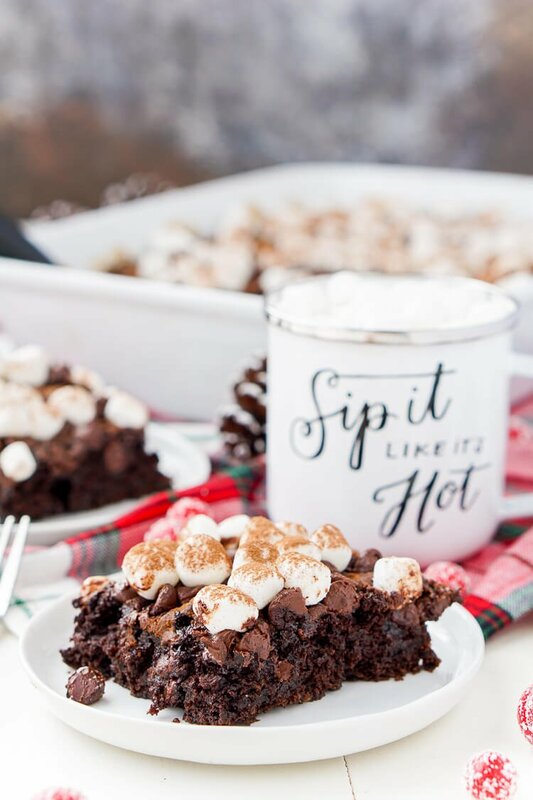 With this Hot Chocolate Dump Cake, there's no need to decide between hot cocoa and chocolate cake – you can have both! An easy holiday dessert made with just six ingredients! Preheat oven to 350 degrees F. Grease a 9x13-inch pan with cooking spray and set aside. In a large bowl, whisk together the pudding mix and milk for two minutes. Stir in the cake mix and 2 cups of the mini marshmallows. You can either stir the chocolate chips directly into the batter or you can spread the batter out into the greased pan and sprinkle the chocolate chips over the top. Bake for 30 to 35 minutes. Remove from oven and sprinkle with remaining marshmallows and the hot chocolate mix and allow to cool in the pan for 1 hour before serving. It looks perfect. Gorgeous, appetite-inducing photos!! Wow, this looks so gooey and delicious, love the marshmallow on top so delicious! Love chocolate cake and this look amazing with the marshmallows. This is so epic. Ive never tried a dump cake before but youve totally sold me on this! Now this is my kind of cake. Perfect for curling up on the sofa with and a cup of coffee. This looks super delicious and I love that it only needs six ingredients! I can see this being very popular in my household!